During the resort’s annual Wellnessing Getaway last week, the luxury Grand Velas Los Cabos launched a new welcome amenity for its Wellness Suites. The Wheatgrass Margarita kit was a surprise delight on arrival and a healthier option to try later this month on National Margarita Day (February 22nd). During the resort’s annual Wellnessing Getaway last week, the luxury Grand Velas Los Cabos launched a new welcome amenity for its Wellness Suites. 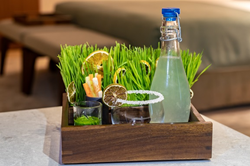 The Wheatgrass Margarita kit was a surprise delight on arrival and a healthier option to try later this month on National Margarita Day (February 22nd). Wheatgrass is high in nutrients and antioxidants like vitamins A, C and E, as well as iron, magnesium, calcium and amino acids and has also been known to lower cholesterol. The duplex Wellness Suites at Grand Velas Los Cabos also offer a plethora of fitness and wellness amenities, including a MUSE brain sensing meditation headband, artisanal soap selection, healthy gluten free snacks and daily juice options, water menu and an in-suite exercise kit comprised of a yoga mat, dumbbells, resistance bands, and even an exercise bike. Below the resort shares its recipe to make at home. Combine all ingredients in a shaker, shake and pour over ice. From January 24 – 26, Grand Velas Los Cabos hosted its 2019 Wellnessing Getaway featuring industry gurus Nikki Sharp, wellness expert, yoga teacher, vegan-trained chef, and best-selling author; Benjamin Decker, meditation teacher, author and director of the Institute for Transformational Thinking; and yoga teacher and nutritionist Karla Tafra. Activities ranged from healthy cooking and nutrition workshops, tools for practical meditation, and an energy purification ritual to yoga, beach barre, and aromatherapy.